I enjoy and respect high-style and creative restaurants, but I wouldn’t want to dine at them every day. Sometimes I’m looking for peak experiences, for epiphanies about what can be done with an arsenal of ingredients and methods and a daring attitude, but eating special things every day would make them less special. There are days when I want nothing so much as solidly cooked comfort food. One of my comfort foods is ramen, which is probably no surprise because in whatever culture a bowl of noodle soup is everybody’s favorite comfort food. So when a place opens that offers it, they’re going to get a visit from me sooner or later. 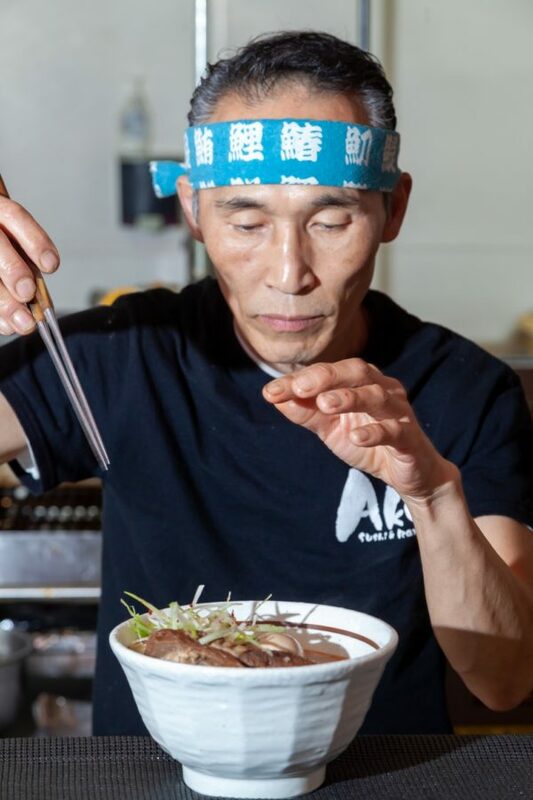 The latest in the South Bay is Aka Sushi and Ramen on Aviation at Prospect, which took over the former Gu Gu Sushi bar. Gu Gu offered a huge menu of extravagantly seasoned sushi rolls and very little that resembled Japanese traditions, while the offerings at Aka are less wacky though not all completely traditional. (One odd thing about Aka is that the word means “red” in Japanese, but almost nothing here is red except their logo and the traditional lanterns that hang above the sushi bar.) That aside, the environment is unremarkable and unpretentious, the noise level moderate. On two different visits the staff were helpful and suggested items we might want to try, and as is our habit we followed their advice. For starters we tried a yellowtail roll, tuna-wrapped California roll, an order of tempura, and an item called firecracker that was a slice of tempura eggplant topped with spicy tuna, avocado, and a drizzle of chili sauce. The sushi items were exactly as described, no surprises for good or bad. What they promised, they delivered. The tempura didn’t have the crispness you get at the places where it’s a specialty, but it was okay. The surprise was the firecracker, which used the slice of fried eggplant as a flavor and texture contrast to the minced spiced fish and avocado. It was a set of conventional flavors uncommonly well combined with the bonus of varied textures, and probably the best item we had here. We followed these with the ramen, which is what we came for. In one crucial way Aka is not up to the standard of some other local ramen specialists; they use dried noodles instead of fresh, and the dried stuff doesn’t have the springy texture that you get from something that was a pile of dough a few hours ago. That said, these aren’t the ramen that kept you alive in your first apartment, because the flavors in their broths are fresh and vivid. The versions here all are spicier than is traditional thanks to the use of chili oil, and I asked a server whether the owners might be Korean. He told me that the chef is Japanese but worked in Korea for years and incorporates those flavors, so I was close. This was most obvious with the Samgyeopsal, which is also called Ssam for short – the double letter at the beginning signifies that you should hiss it just a bit. In its simplest form Ssam is just unmarinated pork belly, but most versions spend some amount of time in a mix of garlic, pepper, and vinegar. There was a crust at the edge of the pieces in my soup that suggested that these were also soaked in a spicy bean paste marinade, but I’m not sure about that. However the effect was achieved, it added a little extra tanginess to the meat, which also had a concentrated porky flavor. The bowl of soup arrived at our table hot enough to burn my mouth, and as it was also exuberantly spicy the effect was magnified. The next time I have a cold I will come back and order this, because I’m sure I could taste the flavors even through plugged sinuses. The lemon broth was a lot milder but still had a little chili kick, and it was a pretty swell idea. 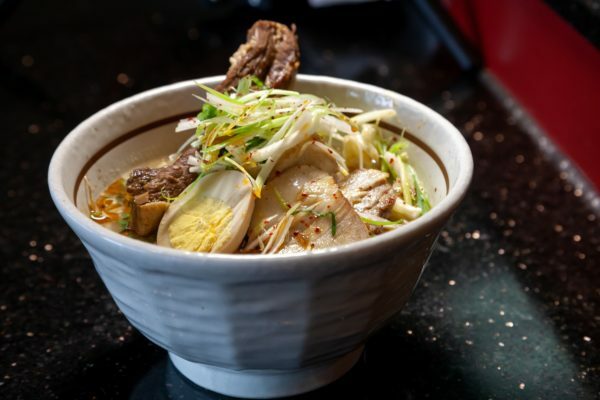 There were several thin slices of lemon floating in the broth which made the dish fragrant from across the table, and if you’re ready to consider trying a spicy, citrusy version of ramen, I highly recommend it. We also tried two more standard items, tempura ramen and negi ramen. I hadn’t known what the latter was until I was told that negi is the Japanese word for green onion – as I mentioned, the menu descriptions could use some work. This ramen has a double portion of green onions and Japanese style chashu pork, and it’s probably not news to anybody that pork and onions go quite nicely together. Japanese style chashu doesn’t have the sweet crust that distinguishes the Chinese version, and is more like thinly sliced pork roast, so you taste the natural ingredients along with the omnipresent chili oil. They can probably leave the oil out entirely if you ask, and I wish we had on this item. Tempura ramen is a standard item that I find mystifying – why would you dip vegetables in batter and fry them crisp, then put them on top of soup so they get soggy? The bed of bean sprouts and pork slices on top of this soup kept the tempura from being completely inundated, so we concentrated on that first while allowing the soup to cool. Aka Ramen and Sushi offers drinks that are typical of a moderately priced Japanese restaurant, beer and some decent but not premium sakes, plus a few fruit flavored soju drinks. It was cold on the evening we were there so we enjoyed a hot flask of Koshu Masamune and enjoyed its warming effect. You can expect to spend just over thirty dollars a person at Aka for dinner with a drink each or a shared sake. I have spent more than that on two appetizers at other South Bay Japanese restaurants, and I think I might have spent that for one app at some places. If you’re looking for a special occasion place, look elsewhere, but for an everyday meal in pleasant surroundings this is a fine choice.